Where Do Parks Come From? San Jose residents often ask, “How can our neighborhood get a park?” At present, there are three sources of new parks in San Jose—all depend on being near new housing developments. One method: a developer of new housing will provide land for a new park. Examples include many new parks in North San Jose. Alternatively, the City collects Park fees from developers of new housing. The fees go into the “Park Trust Fund” to be used only in the nearby neighborhoods of the new housing. Park Trust Fund money is also used for major “capital” repairs. Finally, the City can apply for grants. These grants have matching funds requirements that tap the Park Trust Fund. This means new parks are now limited to areas near new housing complexes. Established neighborhoods far from new housing have no source of funds. To learn more about the Park Trust Fund and how it works, click on Park Trust Fund FAQ. Other jurisdictions use a variety of sources to finance new parks. The City of San Jose could ask voters to approve these successful programs. Santa Clara County uses a Park Charter Fund to buy new parks. The County sets aside a portion of property tax revenue that always goes to parks. The Santa Clara Valley Open Space Authority uses a parcel tax to fund its land acquisition. In other communities, special park districts are formed that operate separately from city finances. For example, Greater Vallejo Park District was unaffected by City of Vallejo’s bankruptcy. Voters created and funded parks separately. What should the City of San Jose do? What financing method San Jose Park Advocates lobby for? Let us know. 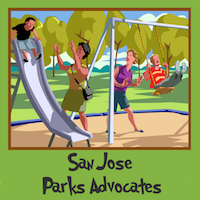 Join us in our drive for more parks for San Jose. What is the Park Trust Fund? San Jose’s Park Trust Fund comes from fees charged to developers for building new additional housing units. Fees are not charged for replacing an old house. Why are Park Trust Fund fees charged? The fees are charged to provide parkland and recreation for the new residents or to mitigate the impacts of new residents on existing park and recreation facilities. How are Park Trust Fund monies used? Park Trust fund money supports capital expenses, such as land purchases, park development, community center construction, park amenities, and bigger maintenance projects such as turf replacement or pool repairs. What are the limits to spending Park Trust Fund money? Park Trust Fund money can only be spent near the new development. The fees can be spent two ways: 1) for ordinary neighborhood parks and their amenities within ¾ miles of the new project or 2) for community parks and community serving features up to 3 miles away. Examples of “Community serving” include swimming pools, skate board parks, trails, or a community center gymnasium. How much money is in the Park Trust Fund? Only $23M is unallocated and the money is restricted to different parts of the city. Fee payments that are expected from this year’s new buildings are not included in the budget. Didn’t the Park Trust Fund have $100M last year? The Park Trust Fund was holding money to acquire land in North San Jose for a park with sports fields and a community center so the balance got high in 2013. In 2014, the City Council authorized the acquisition of Agnews in North San Jose ($15M) and was able to acquire some property and develop other properties. This dropped the balance to $68M. Why did the Park Trust Fund have a large balance? Money is being cumulated to pay for a new park. It can take many years to accumulate enough money, find willing sellers, negotiate, clean the property, and close escrow. Some negotiations fall through and staff must start over. The City Council stopped the development of new parks during the Great Recession. This created a large backlog of projects and the fund bulged. Many areas of the city have little new housing development. The money from the few new housing units is held until enough money in the area is collected for a meaningful project such as playground rehabilitation. There were few staff members to handle the work. During the Great Recession, many employees were laid off or not replaced. Remaining personnel had multiple job responsibilities and worked each responsibility part-time. One major opportunity, Agnews, consumed a high portion of staff time. Park acquisition and development requires real estate specialists, negotiators, contract specialists, attorneys, landscape architects, and project managers. Some replacement positions were authorized and were hired in 2014. Some money is set aside to cover the cost of expected future major infrastructure repairs such as replacing the heating system for a pool, or a new roof on a community center. What is an example of money being accumulated for a future project? The joint use agreement with Leland High School in the Almaden Valley requires the City to replace the artificial turf at the end of its life span. There is little new housing development within 3 miles of the project. According to District 10 council staff, money is being saved from the very few housing units to pay for the turf replacement. Why is some money not allocated to a project? In 2014, about $22 million was not allocated. Some of this money is in small amounts in isolated parts of the city. Most of this money is being held for an opportunity. Staff is actively seeking willing sellers in some parts of town. Staff will apply for grants from agencies; the city must have 50% matching funds available to qualify. When the grant is for park development, the city must pre-pay the costs and the State or other Agency will reimburse the City. There has to be money on hand to take advantage of these projects. This is a council-authorized strategy. Sometimes an unexpected opportunity for land acquisition appears. Staff wants to be able to respond to opportunities. At present, December 2014, the City is in confidential negotiation for two properties, in Districts 1 and 6. How long can money be kept in the Park Trust Fund?All Park Trust Fund fees must be assigned to a project within 5 years of the fees being paid. The money may be spent many years later when enough money is accumulated. Money that is not assigned to a specific project within 5 years can be refunded to the developer if the developer wishes. What is the difference between Capital projects and Operations and Maintenance? Operations refer to activities such as recreation events, and park rangers. Maintenance refers to the day-to-day activities such as mowing the lawn, pruning hedges, fixing drinking faucets, unplugging toilets, and adjusting sprinklers. Capital projects are land purchases or major maintenance such as a new roof, turf replacement, or new children’s playground. Why aren’t Park Trust Fund fees used to improve the operations and maintenance of our parks? The city’s Park Trust Fund ordinances are based on the rules in California’s Quimby Act and the Fee Mitigation Act which both forbid using the money for operations and day-to-day maintenance. The Park Trust Fund is designed for acquiring and developing parkland and performing major capital maintenance. Fees are set every year based on the cost of land. Because the cost of land varies throughout the city, the fees charged vary in different parts of the city. The fees change every year, vary by the type of housing unit, and vary throughout the city, but an approximate range is $15,000 to $ 20,000 per unit, with “granny” units set at a lower level. Fees are based on a rate of 3.5 acres of bare land per thousand residents. Why do downtown highrise projects only pay half their fees? For the first 2564 highrise units, San Jose City Council discounted the fees to provide an incentive to build downtown towers. This program started in 2007 and will end in 2015. Overall, about $20 Million will not be collected and many downtown area projects were delayed and downtown residents have had to do without. What are “private recreation credits”? When a developer provides recreation facilities to the residents of the new development, there is a credit based on the square footage. The developer can claim up to 50% park fee credit. In practice, most developers receive credits for about 20 to 25% park fee credits for their private recreation. Why don’t we get 3.5 acres per thousand new residents? Sadly, San Jose has designed the finances of its park system so that the Park Trust Fund is an important source of major infrastructure repairs instead of buying parkland to serve the new residents. Also, San Jose uses Park Trust Fund Money to develop the parks from dirt to parks full of amenities. Developing parkland with plants and amenities costs about the same as the cost of buying bare dirt. In addition, developer private recreation credits reduce the total amount paid by permission of the state law that was the model for San Jose’s Park Fee program. Finally, the City Council has chosen to discount about $20M in Park Trust fund money. Recently there was a proposal to divert another $11M. Whenever money is not collected or spent on things other than dirt, it reduces the acreage that can be purchased for residents. Overall, the 2009 Greenprint provides guidance for new projects: land acquisition, and new buildings. It identifies neighborhoods that are park deficient. Staff keeps track of major infrastructure repairs and when they will be needed. They combine this information and develop a proposed priority list. The local Councilmember makes final decisions on priorities. Is it true that there are no projects that could use the Park Trust Fund money from downtown housing? According to a November 2014 staff report, there is $40M to $50M in downtown park projects that are planned and approved. Some have been delayed for years, such as the Roosevelt Community Center gymnasium. This list does not include other projects that are conceptual, such as all of the “green fingers” of the Diridon Station Area Plan and the Los Gatos Creek trail “daylighting” and connection to Confluence Park. Is it true that downtown is completely built out and there are no new parks possible for downtown? Downtown has buildings on nearly every parcel—but there are still possibilities for parkland. For example, the Redevelopment agency facilitated acquisition of O’Donnell Gardens Park at 6th and Williams in 2002. Now, there are willing sellers who have offered their land for sale. As more land is acquired by developers of high density housing, there probably will be more willing sellers or possible land trades. Most of these possibilities are for small acreage of under 1 acre. Some council members have expressed a strong bias against small acreage parks, even though resident surveys show preferences for nearby parks over larger parks that are further away. Why is there a bias against small parks? Some members of the City Council believe that small parks are too expensive to maintain compared to large parks. However, no analysis has been made since the new contracts with outside vendors were implemented and since introduction of the new Business Intelligence system of Park Maintenance Management. Also, small parks don’t have “community-serving” features, so it can be harder to find Park Trust Fund money that can be used to do rehabilitation as the equipment or turf wears out. (Yet, these parks qualify for funding from the greater Construction and Conveyance Tax monies.). Finally, there is a large need for sports fields, and some council people prefer to hold onto the Park Trust Fund money in their district in order to buy a bigger parcel that will accommodate sports fields. What’s good about small parks? Small parks help neighborhoods to develop a sense of community, which is particularly important for high density residential neighborhoods.. It is easier to find volunteers to adopt the smaller parks and to do some of the routine maintenance. Smaller parks are easy for volunteers to program with community-oriented activities. Small parks do just as good a job as large parks for encouraging walking by adults and play among younger children. Smaller parks are easier to locate near existing residences—the impacts are smaller. Small parks are safer since they usually have many “eyeballs” overlooking the park, as is common near higher density residential projects. Where can I learn more about the Greenprint and the Park Trust Fund?